The kitchen here at Apple Hill is a busy place these days. You know those days? When you are cooking, peeling, stirring, canning while in your yoga pants and t-shirt, and hoping desperately that no one just drops in to visit because 1. every pot in your kitchen is in use; 2. you surely don’t have time to take a break to talk to anyone; and 3. you were so busy getting into the kitchen that you might have forgotten to brush your teeth and you definitely didn’t comb your hair. 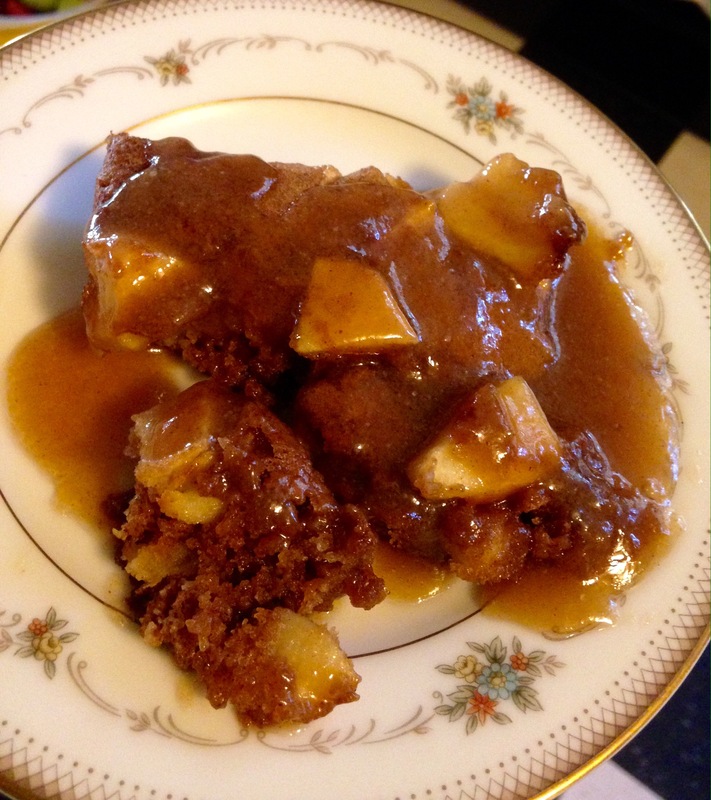 It goes by the humble name of Apple Pudding Cake. I know, not exactly exciting or gourmet sounding is it? 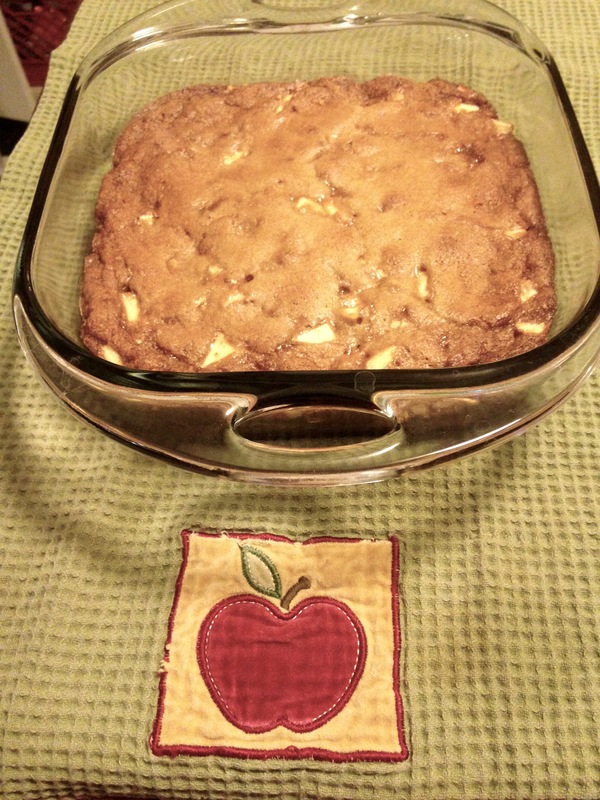 But this is the most luscious, caramel-ly, apple-ly, golden brown earthy goodness you will ever taste. And if you want to make it even more so, there is a simple warm caramel sauce that you can ladle over the cake that will just send you and your tasters over the moon. Or at least over your favorite apple tree. And after a quick scan of the ingredients, you can also see how basic the ingredients are. Most likely they are sitting in your food pantry this very moment, just calling out to be made into this simple, simply amazing pudding cake. 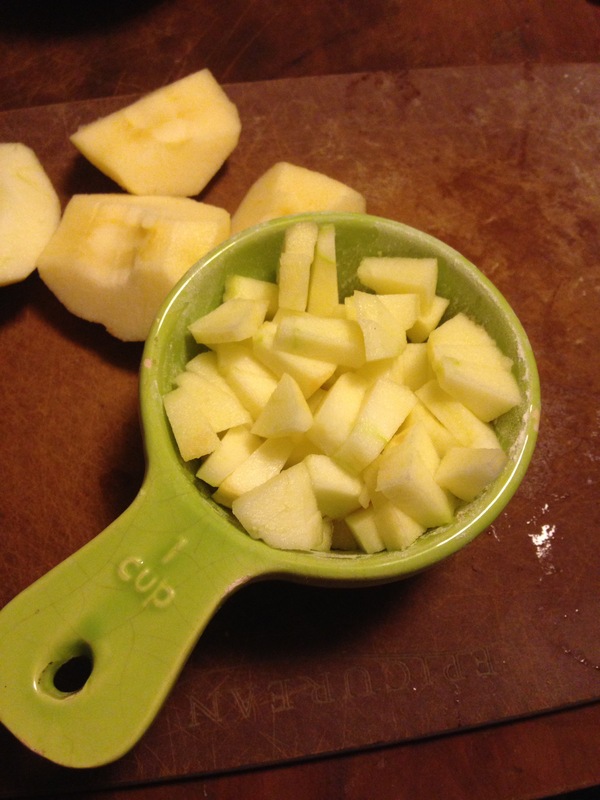 Peel and chop apples to make two cups. Depending on the size of your apples, 2 or 3 is likely. I also like to mix and match the apples — you can see in the first photo I used a red apple (Jonathan) and a yellow/green apple (Grimes Golden). But really, just use what you have. I don’t think this dessert could possibly be ruined by using the wrong apple. Although I will say that if you are using a bland Red Delicious sort, you might want to zing them up slightly by squeezing half a lemon over them. If you are reading the recipe card in the photo above, you will notice that it also suggests using mini-bundt pans. I tried this several times and had no success getting them out of the pans in any kind of decent shape. Maybe you will be better at that than I am, but I gave up and now just serve it as homely squares on a plate. When you make the caramel sauce to go over it, no one will care that it isn’t in some fancy shape. To make the caramel sauce, melt 1/3 cup butter in a small pan. Add 2/3 cup sugar (I use 1/3 cup lightly packed brown sugar and 1/3 cup raw sugar) and stir until well-mixed and starting to bubble. 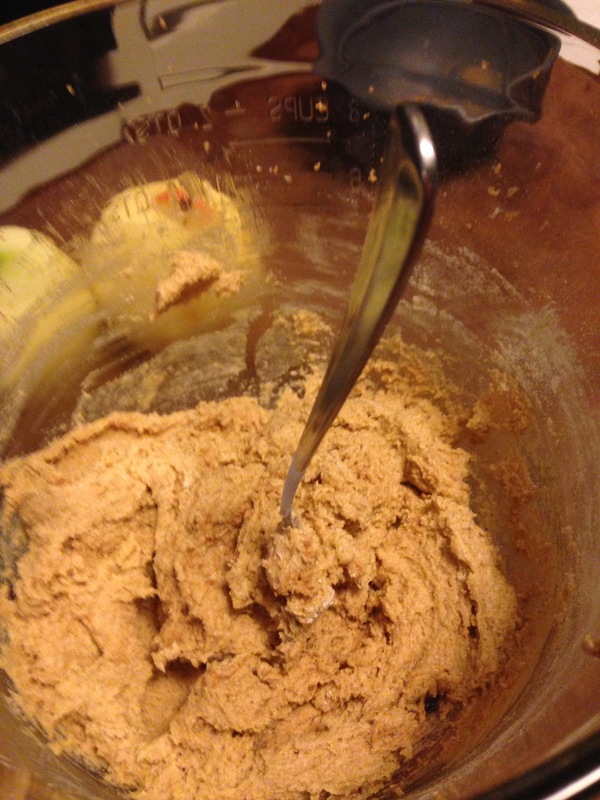 Add 1/2 t. cinnamon and slowly add 1/3 cup half-and-half, whisking well. Let simmer over low heat until it is no longer sugar-y. 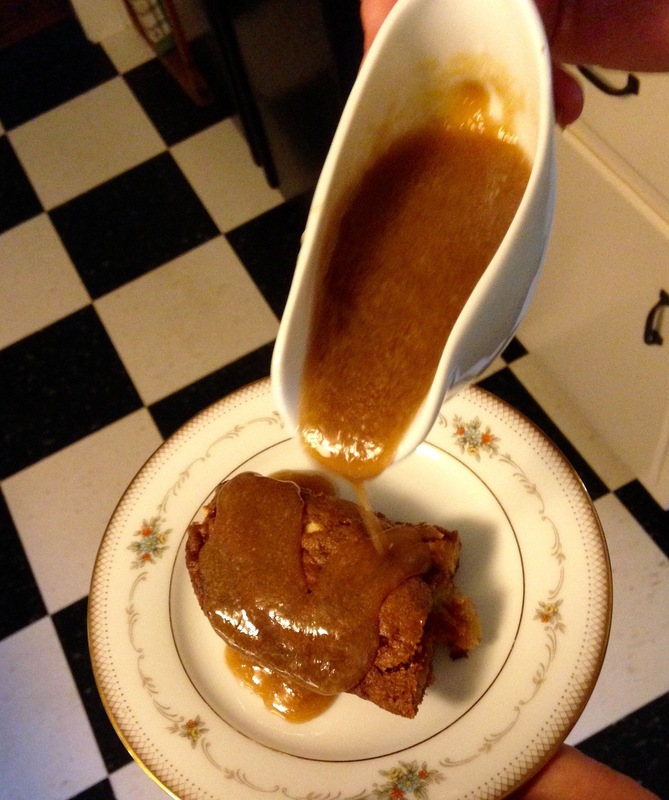 Drizzle, ladle, or pour the warm sauce over individual squares of cake. This sauce guilds the lily. Truthfully, I only make the caramel sauce when I’m serving this for company (or taking pictures for a blog post) but the first time you make the cake, you should definitely have the sauce with it. You need to be able to make an accurate decision about when to make the sauce and when to have it just plain. Plain or fancy — Which are you? 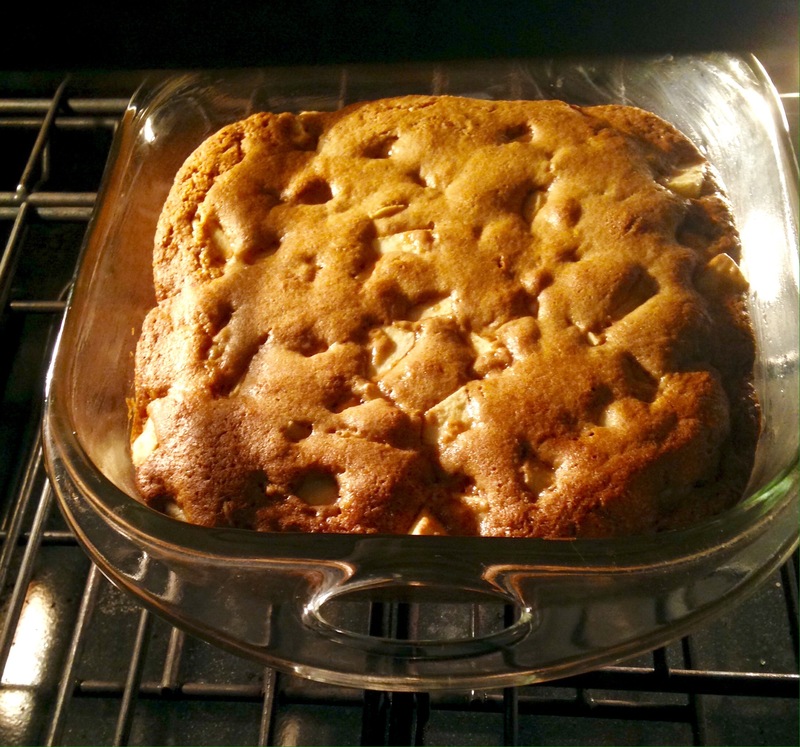 Smell the apple-cinnamon-brown sugar deliciousness? ← Are you looking for a sign? What time can I come over to have a big serving of the cake? My husband ate it all last night. Sorry. Didn’t even save any for breakfast! I will try this–thank you? Any Northern Spy apples in your neck of the woods? I would eat this wonderful dessert either plain or fancy and probably every day. I’m having company for dinner later this week, and guess what they’re going to enjoy! Thank you, thank you for a recipe I know will become a favorite of my husband and me..
What a great post. 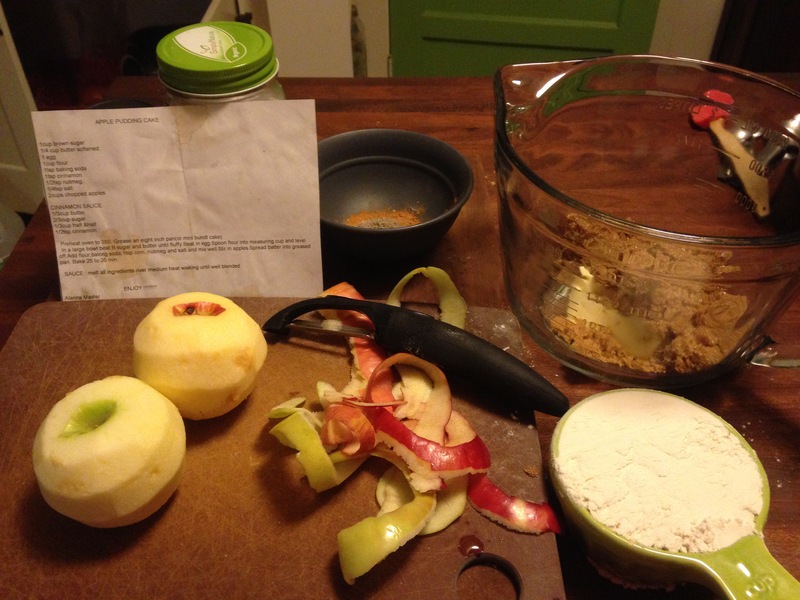 I love apple-y recipes. And ones that I can convert to gluten free make my heart happy. :) Thanks so much for sharing your recipe. I’m looking forward to trying it! Even with my limited baking skills, I think this is a recipe I can follow successfully. And I do like apples.😊 Thanks for sharing this recipe. Oh boy does this look scrumptious!